This week we have touched the 3 most shouted about problems with plastics: PVC, Phtalates and BPA. But being surrounded by plastics in cars, toys, packaging, clothing, home goods, food utensils, medical devices and so much moreI think it is really useful to offer some more clarity in the different types and how their use affects our environment. And if avoiding them is impossible how to recycle them and avoid littering our streets, clogging our waterways and choking marine life. There are 7 main plastics types, grouped based on how they can be recycled. So if you have plastic, it should have the recycling symbol embossed and a number inside. In most cases where there is no number embossed it is PVC. Found in: Soft drink and water bottles; mouthwash bottles; dressing and vegetable oil containers; ovenable food trays. Recycling: Picked up through most councils recycling programs. Recycled into: Mainly every type of textile made of Polyester. If it is recycled material it will clearly state rPet instead of regular Polyester PES. Recycling: Picked up through most recycling programs, although some allow only those containers with necks. PVC is tough and weathers well, so it is commonly used for piping, siding and similar applications. PVC contains chlorine, so its manufacture can release highly dangerous dioxins. These dioxins spread in the air and are moved by wind and breath in by any living creature, thus damaging the entire biosphere. If you must cook with PVC, don’t let the plastic touch food. Also never burn PVC, because it releases toxins. LDPE is a flexible plastic with many applications. Historically it has not been accepted through most councils recycling programs, but more and more communities are starting to accept it. 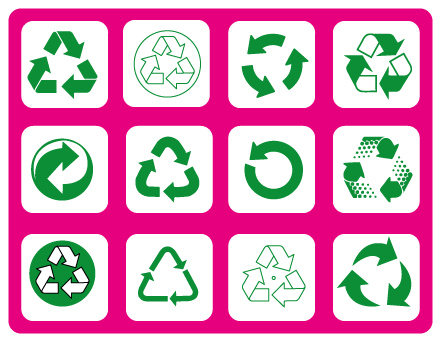 Recycling: Number 6 plastics can be recycled in some councils. A wide variety of plastic resins that don’t fit into the previous categories are lumped into number 7. A few are even made from plants (polyactide) and are compostable. Polycarbonate is number 7, and is the hard plastic that has parents worried these days, after studies have shown it can leach potential hormone disruptors (as Polycarbonate has BPA in it). I am working on a post where I am linking all this information to Toys and the toy industry. You could all help by letting me know which symbols you can find on toys around your house! I will do the same!